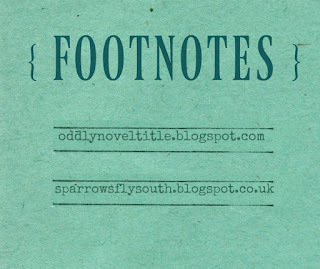 Footnotes is a monthly link-up hosted by Ashley and Emily. It's all about sharing quotations. Just in time, I'm joining up with the October prompt, which is: a quotation from a poem. Of thoughts the mind conceives. I've definitely experienced thoughts and feelings that I wasn't able to express in words; sometimes this might be because I don't have the words or don't understand my thoughts well enough, but other times it does seem like language is inadequate. However, one of the joys of collecting quotations is that sometimes you find that others have said things that express your thoughts perfectly, when you weren't able to do so yourself. I like this! So, so true. It's always difficult to figure out how to translate what's going on in your head to something that will other people will understand in full. Thanks for linking up with us! Yes, I always associate the name Gilbert with Anne of Green Gables! I guess it's not a very common name.